My oldest's first day of K-3 school is almost here! Today I put some labels on his extra clothes and packed the backpack. 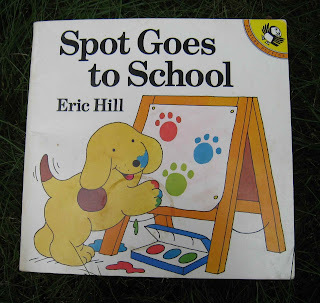 We also read Spot Goes to School , a lift-the-flap book by Eric Hill. Both boys love this book, and it's a great read for younger children as well as 3-, 4-, and 5-year-olds who are starting school. My two-year-old squealed when the flaps were lifted to reveal surprises on each page, and it's delightful to see him enjoy this book so much. For my almost four-year-old, Spot Goes to School gives a nice summary of what a first school day might be like -- a welcome by the teacher and class, some first feelings of nervousness, a show-and-tell, a story time, playground time, and art time. At the end of the day, Spot is having fun and doesn't want to leave yet, but he does, taking his painting home with him. I love lift-the-flap books. Spot Goes to School has held up well in our household -- we've only had one flap tear, and it was easy to repair. The pages are a heavier weight that's been sturdy -- I think our copy will survive all three of our kids. 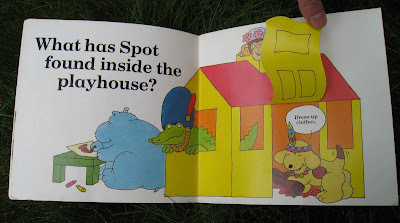 Spot Goes to School is a fun book with a nice message, and it's one of our family favorites. My children would love this one as well. I can't remember the ones we checked out from the library... I've promised reading after school today so maybe when I take the current books back we'll look for this one. Petula, yay for library visits! I usually just browse while there but I've been thinking of using their internet system to hold children's titles that we're interested in reading. It's also almost time to sign up for fall storytimes and reading programs -- summer went by so fast! I checked your blog and your family is beautiful!